Bill has over 40 years of professional experience, including 30 years in the field of environmental engineering and management. ﻿ He also teaches a graduate course for the University of Florida's distance learning program, "Principles of Green Engineering Design". In addition, Bill designed and delivered a 25-module on-line course for the American Society of Civil Engineers﻿ called "Engineering for a Sustainable﻿ Future: Principles and Practices for the Built Environment". 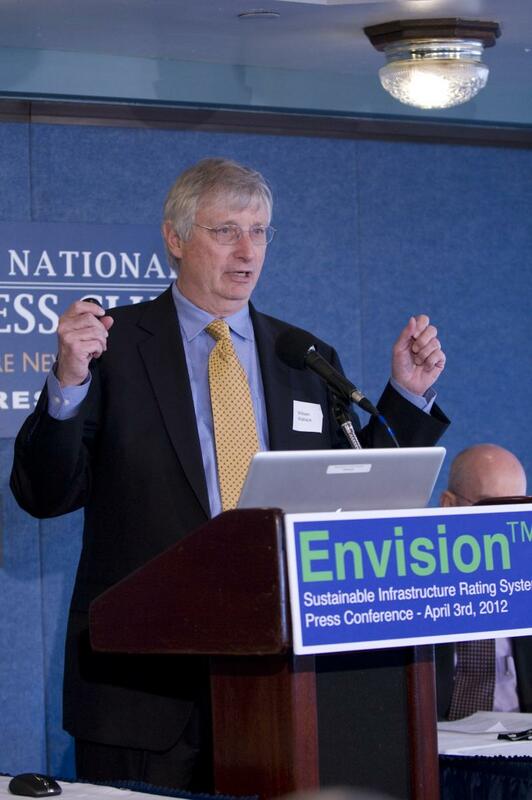 Wallace Taking questions from the audience at the Envision Press Conference at the National Press Club in Washington, DC, April 3, 2012. Bill is a frequent lecturer on sustainable engineering at several universities. He has been an invited lecturer at the University of Florida (Ohanian Lecture Series), Carnegie-Mellon University (Distinguished Lecturer Series) and Clarkson University. Bill has authored over 60 technical papers, presentations and invited U.S. Congressional testimony covering subjects such as hazardous waste management, environmental technology, engineering standards, and sustainable development. Bill is currently a member of the Board of Directors of GeoEngineers, Inc.
Bill's bio is available here. Copyright Wallace Futures Group, LLC. All rights reserved.